Plans to form a new "super university" in Wales appear to be dead in the water. The University of Wales Institute, Cardiff (Uwic) said it was "no longer a participant" in merger discussions to establish a new University of Wales. Proposals to merge Uwic, Swansea Metropolitan University and Trinity Saint David as The University of Wales emerged in February. Uwic said it "regrets" the outcome because it had supported the idea. Meanwhile, the University of Wales said it was is still investigating the options available for a merger with other universities in Wales and discussions were "ongoing". 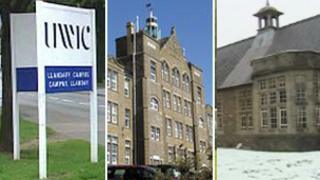 Its history is as a federal body with colleges in Bangor, Aberystwyth, Swansea and Cardiff. But they have largely separated from the University of Wales in recent years. Last Saturday, university vice chancellors in Wales signalled a move towards "fewer but stronger" universities, which appeared to discount a "super university" idea. A Uwic spokesman said of the University of Wales idea: "Since the inception of merger discussions Uwic has become increasingly dissatisfied with a lack of attention to good governance, due process and administration. "Uwic regrets this outcome because hitherto it has been unrelentingly supportive of the University of Wales, shown by the considerable resource it invested to achieve the positive outcomes for the University of Wales in its recent QAA (Quality Assurance Agency) institutional review. "The Uwic board of governors at its next meeting will reflect on recent events and consult with staff, students and stakeholders about its options." He added that Uwic was a "strong, financially viable university, attractive to students and with a track record of sustained success and high performance". Swansea Metropolitan University would not comment and Trinity Saint David has been asked for comment. The agreement between the three universities emerged in February. It came two months after Education Minister Leighton Andrews challenged universities to "adapt or die". Last Saturday, the body representing universities, Higher Education Wales, recommended a reduction in the number of Welsh universities. The body said Wales would benefit from fewer but stronger universities and the new approach would mean "further reconfiguration of the university sector". This may mean the number of universities falls from 10 to six and signalled there would be no super-university of Wales. Swansea Metropolitan and Trinity Saint David in Carmarthen and Lampeter are already looking towards a merger. Uwic is expected to look towards a parnership with another institution in south east Wales.